Heat exchangers are one of the most critical — yet frequently overlooked — furnace components. A heat exchanger makes possible the transfer of heat from your furnace to the air of your home, but it keeps toxic exhaust gases safely sequestered. Over time, however, such caustic substances take their toll on the structural integrity of a heat exchanger. If not inspected and maintained on a regular basis, a heat exchanger may succumb to serious problems, such as cracks and corrosion. These issues will affect your furnace’s efficiency and allow dangerous substances into your home. 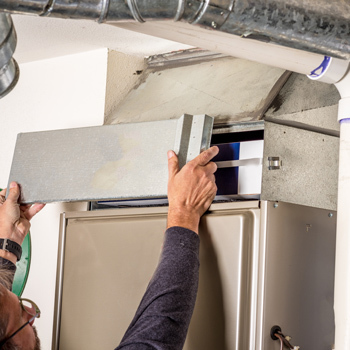 This article will help to increase your furnace troubleshooting skills by discussing several different ways to diagnose a heat exchanger problem, from the most basic to those used by professional HVAC technicians. All homes with furnaces and appliances that run on natural gas should contain multiple carbon monoxide alarms. Best practice dictates that there be at least one such alarm on each floor of your home. Because carbon monoxide possesses no scent or visual appearance, it will escape detection unless you have the help of these lifesaving devices. If your carbon monoxide alarms have recently been going off, a damaged heat exchanger may be the culprit. Virtually all furnaces produce a certain amount of carbon monoxide during the process of combustion. So long as it passes out of your home through the flue pipe, this carbon monoxide will disperse harmlessly into the atmosphere. But if allowed to escape into the air of your home in great enough concentrations, carbon monoxide can be lethal. A damaged heat exchanger represents just one of the many furnace problems that can allow carbon monoxide into your home — but it tends to be one of the most common. Regardless, always be sure to contact an HVAC technician if your carbon monoxide detectors have been going off. Heat exchanger problems may also be indicated by the presence of harsh, chemical odors inside of your home. Often described as being akin to formaldehyde, such odors stem directly from the multitude of combustion byproducts found in exhaust gas. Not only are such gases unpleasant to smell, but they may also produce painfully acute headaches. Those who have begun to notice unpleasant chemical smells in their home must turn off their furnace and contact a professional HVAC technician as soon as possible. Allowing the issue to persist undiagnosed could place you and your family at serious risk. A visual inspection is the first thing a professional does when attempting to dial in the cause of either of the issues discussed above. The most obvious sources of heat exchanger leaks are cracks. Cracks tend to result from what is known as metal fatigue, which stems from the frequent and repeated temperature changes inside of a heat exchanger. As the metal walls of the exchanger absorb heat, they will undergo an expansive force. Cooling off, the metal will contract once more. Over time, this process leads to a large amount of stress, eventually causing cracks to open up along the heat exchanger’s seams. In many cases, these cracks will be large enough that they can easily be spotted when you inspect the exchanger with a flashlight. In other cases, however, heat exchanger cracks may be quite small — too small to detect with the naked eye. An HVAC technician can identify less conspicuous cracks through a technique known as thermal imaging. This involves the use of infrared cameras that allow technicians to spot places where heat is actively escaping from the exchanger. Where furnace problems are concerned, damaged heat exchangers are as serious as it gets. If you have reason to suspect that your heat exchanger has ceased to perform the way it should, call a professional HVAC company as soon as possible. For more information on how to ensure safe and efficient home heating, please don’t hesitate to contact the experts at Eubanks Air Conditioning & Appliance Service.